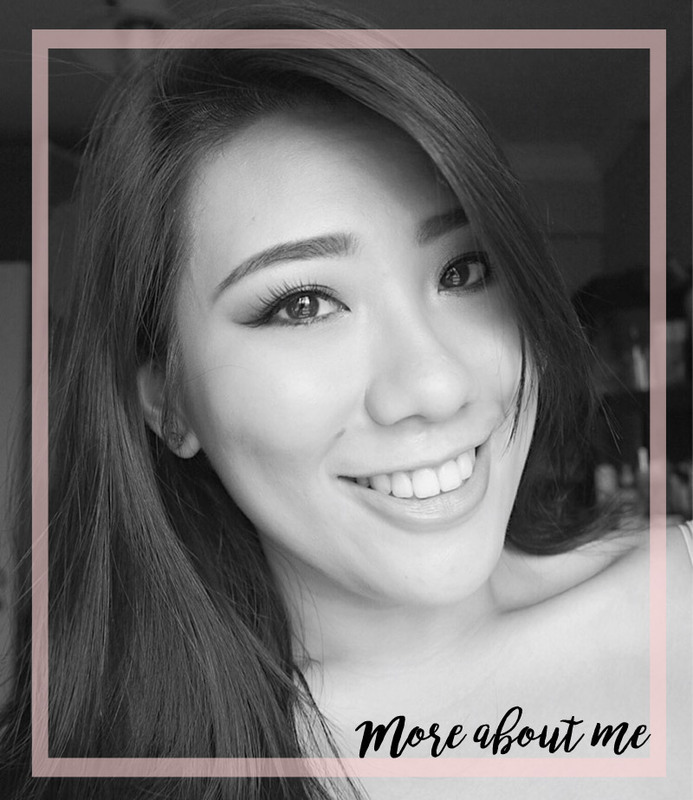 I love using Aloe Vera gel for applying onto sunburns and eyelashes to help em' grow long and strong. As it does not leave any tacky residue behind, this is also my choice when it comes to moisturising the skin before bed. 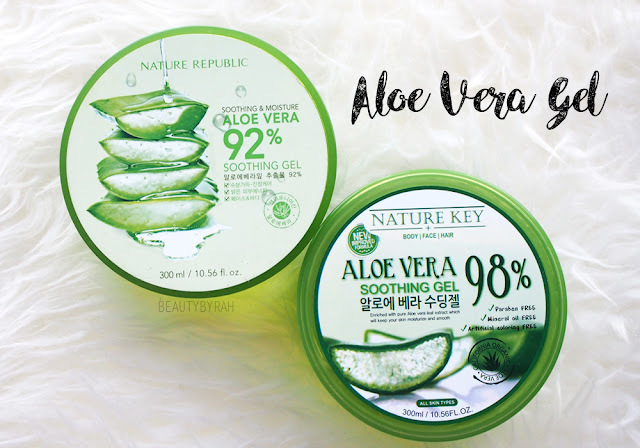 Coming from personal experience, I noticed that a popular aloe vera gel is one from Nature Republic as it is affordable and you do get a lot of product for the price. In fact, I think I went through about 3 tubs of that. I did a full review on it here. If you google, there is a myriad of uses for aloe vera gel, such as applying it onto the face or mixing in with your foundation. 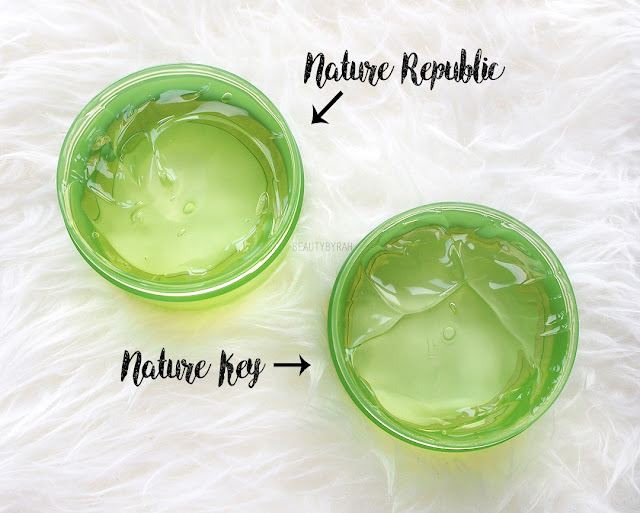 Being a product that provides such versatility, it is no surprise that this aloe vera gel is becoming increasingly popular in the beauty industry. However, I did notice that the second ingredient in the list is Alcohol. As I can't find to no further clarification to what alcohol it is - I am assuming it belongs to the group of low molecular weights (SD alcohol / Isopropyl Alcohol / Denatured Alcohol etc). Now, alcohol with low-molecular weights is a potential skin-irritant and even though it helps the product to vapourise and dry faster for a cooling and dry effect, it could agitate sensitive skin. It also dries out the skin and disrupts the skin surface layers. Considering that alcohol is the second ingredient in the list (meaning a pretty high concentration of it is present in the product), this is definitely a important factor to note. Thus, I do not apply the Nature Republic Aloe Vera Gel onto my face but use it only on my body. Recently, as I was strolling around Big Box, I noticed another brand of aloe gel. 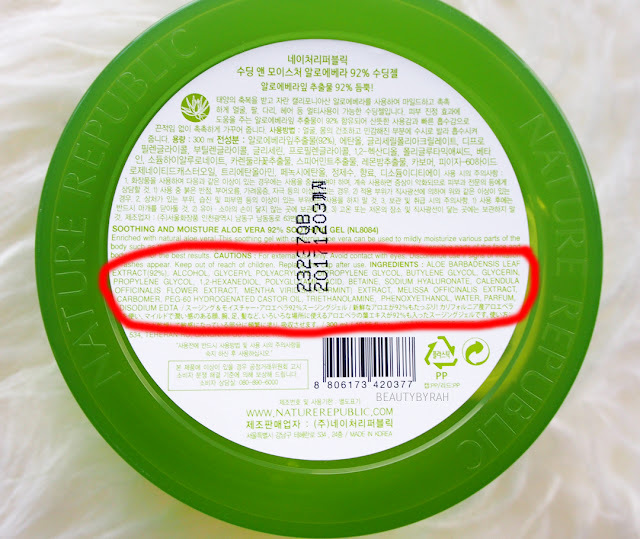 Similar green tub, both are 300ml and are made in Korea - except this has 98% aloe vera content (as compared to the 92% that Nature Republic has) and there is no sign of alcohol in the ingredient list. This is very similar to the cost of the Nature Republic one as well, at SGD 5. In terms of texture, I do find both very similar. Despite not containing alcohol, I do find that the Nature Key Aloe Gel dries nicely to no tackiness as well. In fact, upon analysising the ingredients lists of both, Nature Key has a better mix of emollients and moisturising ingredients that are not potentially irritating the skin. 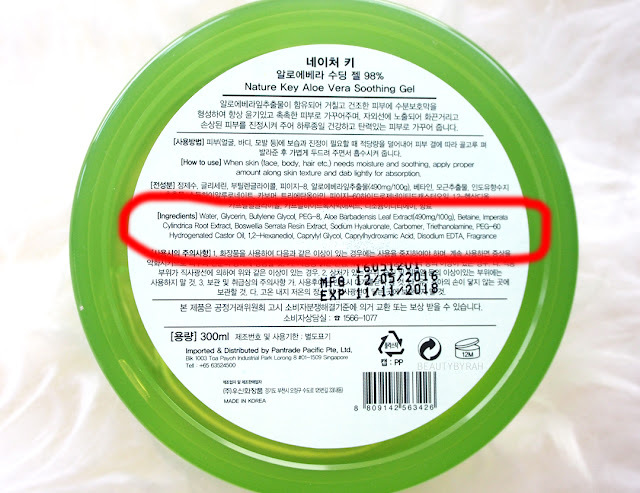 Additional note, as the Nature Key Aloe Gel contains castor oil, I foresee this being great for the lashes as well. So I do highly recommend that you pick up the Nature Key Aloe Vera Soothing Gel if you're on the market for some! Especially if you plan to use it on the face, it is safer to give the Nature Republic one a miss.